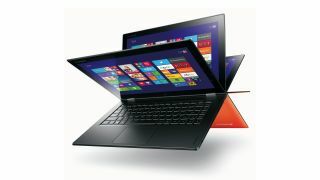 One of the big absentees at this year's IFA in Germany was the Lenovo Yoga 3 Pro, the Chinese company's third generation convertible laptop, one that set the standard for other to follow (or copy). It looks though that it won't be long before the follow up of the Yoga 2 Pro hit the market. German website MobileGeeks has confirmed that some unnamed Scandinavian vendors have already listed the 2-in-1 convertible. The Yoga 3 Pro will apparently come with an Intel Core M-5Y70 system-on-chip, the fastest of the three Broadwell-based processors that were announced at an Intel keynote at IFA. That particular chip runs at 1.1GHz but can ramp its clock speed to up to 2.6GHz via Turbo Boost. It packs 4MB of cache, has two cores and four threads and comes with an Intel HD Graphics 5300 (which has a base frequency of 100MHz and can overclock to 850MHz). Being one of the first chip on 14nm, it consumes only 4.5W, a fraction of what the Haswell-based Core i7-4510U consumed. The rest of the listing also revealed that the laptop will likely use the same 13.3-inch qHD+ display as its predecessor, one that sports a 3200 x 1800 pixel resolution. At just under 1.4Kg, it remains one of the lightest Ultrabooks on the market with such a configuration; the new Yoga 3 Pro will face competition from Asus' new Zenbook as well as Dell's XPS 13 and Toshiba's Portege range.